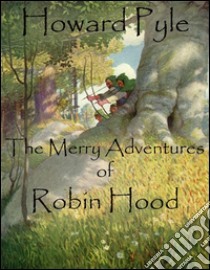 The Merry Adventures of Robin Hood, of Great Renown in Nottinghamshire is a novel by the American illustrator and writer Howard Pyle. Also illustrated in this edition (1912) by Walter Crane and Published by T.C and E.C Jack London. Consisting of a series of episodes of Robin Hood and his band of Merry Men, the novel compiles traditional material into a coherent narrative in a colorful, invented "old English" idiom that preserves some flavor of the ballads, and adapts it for children. The plot follows Robin Hood as he becomes an outlaw after a conflict with foresters and through his many adventures and run-ins with the law. Each chapter tells a different tale of Robin as he recruits Merry Men. Stories of Little John defeating Robin in a fight with staffs, of Robin's besting at the hands of Friar Tuck, and of his collusion with Alan-a-Dale all appear.